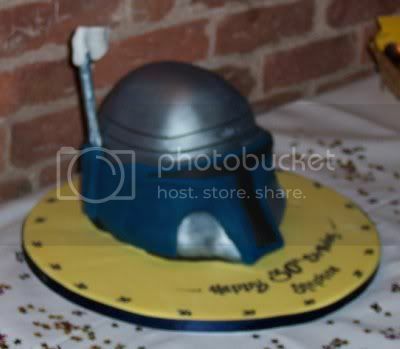 This frosted depiction of Jango Fett (post-decapitation by Mace Windu, obviously) contains a sponge cake with raspberry filling. Which, yes, is a bit fruity for the likes of a Fett, but we’ll let it slide since Steve is otherwise such an ardent Star Wars fanboy. Not only is he the UK reporter for a Star Wars collecting podcast called Star Wars Action News, he holds an annual Star Wars marathon where he and his (very patient) family and friends watch all six films back-to-back. On the same day. That’s a lot of Anakin in one day. Bless their British hearts. 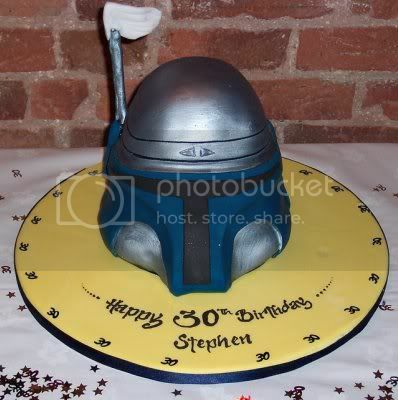 Steve’s wife Suzanne arranged for the cake for his 30th birthday. She engaged the award-winning artisans at Trifles Bakery to create it. Apparently they also make cakes for the UK soap Coronation Street, which is, like, totally famous. If you live in the UK. Many thanks to Steve for sharing the pictures and details. You can click on the pictures above to see his original photos on Flickr. I hate Steve and his awesome cake. Jango brains taste like raspberry eh? Does that hold for clone-/storm-troopers too then? I can assure you it was a damn fine cake – even after way too many beers.